All-Purpose 4-Way™ is formulated to lubricate, penetrate, and displace moisture, leaving parts with a protective anti-rust film. 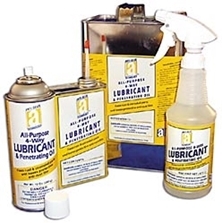 This lubricant protects metal parts which helps eliminate pounding and breakage during disassembly. All-Purpose 4-Way has no CFCs, chlorinated solvents, or silicones. Applications: Frozen nuts and bolts, auto and truck parts/engines, hand tools, farm equipment, marine engines, locks, hinges, fire arms, etc. All-Purpose 4-Way™ is not for sale in the state of California.